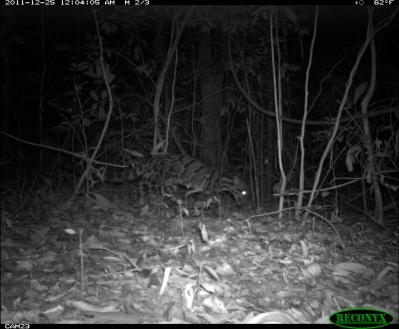 The Thailand small felid survey project 2011 field season continued until April 2011 and finished with 3241 camera nights and 33 mammal species detected, including four felid species (Tiger, Leopard, Asian Golden Cat, and Leopard Cat). The team also began the permit paperwork to work in Don Yai Wildlife Sanctuary adjacent to the north of TaPhraya National Park. The third field season began at TaPhraya National Park and will finish with Don Yai Wildlife Sanctuary. After evaluating the TaPhraya National Park data, the team determined additional sampling was needed prior to analysis. The first 40 (two trapping sessions) cameras were placed in an area that was not surveyed in 2009. These areas include forest near the Don Yai Wildlife Sanctuary and Pang Sida National Park borders. 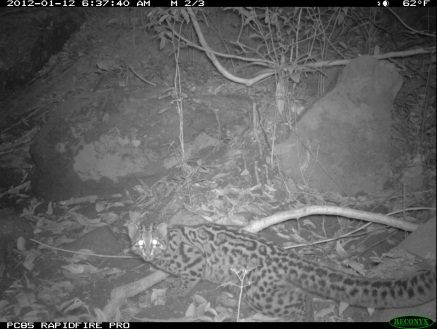 This setup produced photos of a clouded leopard (Neofelis nebulosa), marbled cat (Pardofelis marmorata) (not previously detected in TNP) and spotted linsang (Prionodon pardicolor) (not previously detected in the Khao Yai Forest Complex). Following the camera setup at TaPhraya National Park, training at Don Yai Wildlife Sanctuary was held on February 18-19th to train the park staff on the importance and techniques of surveying with cameras traps. 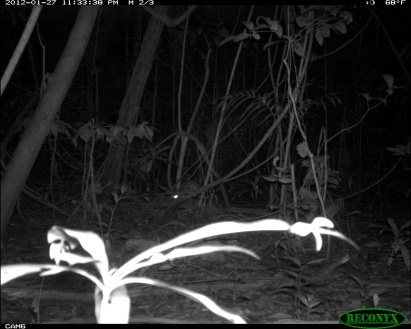 After the training, one final camera trapping session was to be carried out in Don Yai Wildlife Sanctuary. In total three camera setups were conducted in 2011-2012 camera trapping season. In February 2012, Kasetsart University staff conducted the fourth camera trap training course for the rangers and staff at Don Yai Wildlife Sanctuary. The purpose of the training was to: 1) inform staff on carnivore ecology and identification; 2) understand the strategy and reasons for monitoring; and 3) teach the techniques of camera trapping including operation of the Reconyx cameras. The first day consisted of classroom training and basic understanding of the survey equipment. In the morning session, the rangers were taught monitoring techniques and the benefits of monitoring. For the afternoon training, the focus was instructing the rangers how to read maps, use a GPS, and set-up the camera traps. The last day of training involved going into the field with the rangers to demonstrate the information presented the previous day. Future plans for the team include the analysis of the camera trapping and the ex situ data. Surveying will continue in Thailand, as a field assistant starts her graduate school career under the guidance of Dr. Naris Bhumpakphan. The equipment used in this project will be used at two new parks in the region.